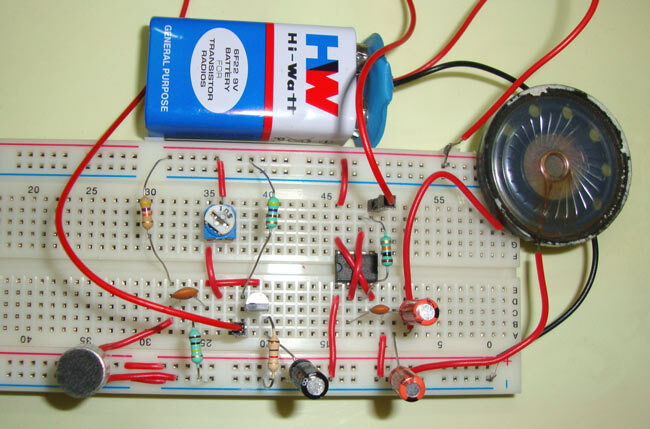 Nice work, what do i need to produce a 5watts audio amplifier. Capacitors 1nf & 100nf not avialable. I also had the same problem, i did know what to do. But i hope Google can give us clarity! How would I change this circuit if I wished to implement it with a 3.5mm audio jack instead of the condenser mic? How good is the sound quality of this circuit? What will happen if the Speakers have more that 8ohms??? Is it possible to use 8ohms 5 inch speaker ( more watts) in the above circuit? If not means what modification I have to do in above circuit to use bigger speaker? And I want to use this circuit for long distance. Example, person-1 should hear clearly person-2 talking. Distance between two persons is 20-30 meters. What changes I have to for that? does it amplify my voice when I speak near the mic ? Do you know DC part has been stopped by C4 capacitor above speaker.its AC that's going into speaker. Guys,when I connected the circuit as given in the diagram a beeep... sound is being heard,though the input is being amplified. Can you tell me why this is happening??????? ?How to stop this unwanted beep sound. Pin 7 is not connected so how does the capacitor discharge? I did not understand anyone, please. my circuit is not work [ic 555 audio] plz help.